Located about five miles from Lake Michigan, GE Aviation’s Muskegon campus includes three facilities that manufacture high-pressure nozzles and shrouds for both commercial and military aircraft engines. With over 800 employees, covering three shifts, the products manufactured at these facilities are used in the hottest portion of a jet engine. This makes it essential for the products to be manufactured with precision—providing the best fuel burn for the airlines and military, as well as improving durability to fly more hours. For years, the GE Aviation team at Muskegon has recognized the importance of combining lean manufacturing practices with digital technology, but in order to continue on a successful digital transformation journey site leadership knew they needed to begin leveraging more digital technology to keep up with higher demand and limited resources. With an accelerated focus on supporting production of parts for the GE LEAP engine, the Muskegon facilities’ machine asset base grew by 32%, while only being able to increase its maintenance workforce by 12%. In order to remain a successful manufacturing shop, GE Aviation had to manage this demand while stabilizing the process for automation. If we’re going to stay competitive, we need to use more of our assets, but we also need to stabilize those assets. The demand on our machine performance is ever increasing, our resources are not, so we’re having to use our subject matter expertise to try and leverage our learnings every day. As part of their digital transformation journey, the Muskegon team worked to shift preventive maintenance from schedule-based to condition or machine use-based to ensure best application of key resources. In order to make this shift, however, the maintenance teams would need access to data and analytics that provide real-time visibility into machine health and enable them to predict possible machine failures before they occurred. GE Aviation partnered with GE Digital to implement its asset performance management (APM) solution on its LEAP production line to model machine data with maintenance history from 400 connected machines. This would enable the team to diagnose health conditions and provide predictive maintenance recommendations—a framework for continuous improvement. By using the asset health manager and policy designer, part of APM Health, the solution integrates machine data, alarm data, and maintenance history to recommend corrective action, and to help optimize machine reliability and availability. The great thing about policy builder is you can integrate all types of data sources into the logic, which initiates actions with any tool that you have in your shop. There’s really no limit to it. The APM solution is collecting data on machine statuses, utilization, and performance. From this, the Muskegon team is able to see machine faults that specifically identify where problems are happening. They can also analyze sensor data to look at pressures, temperatures, currents, and voltages to do trouble shooting and understand root causes, as needed. APM gives us the ability to see what’s happening on the floor even when we’re not around. With people working three different shifts and at three different facilities here at Muskegon, it really helps us with troubleshooting and communicating across teams. 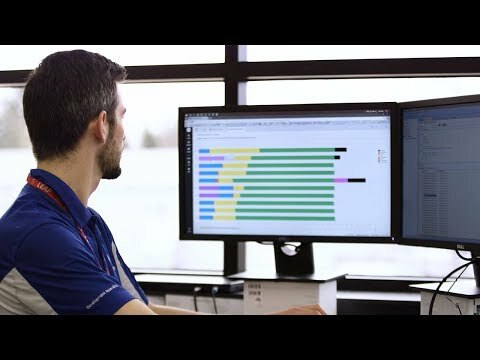 As a result of implementing GE Digital’s APM solution, GE Aviation’s Muskegon facilities have seen improvements in workflow, specifically the way work orders are generated. With APM, work orders are now generated off of machine conditions versus a scheduled calendar. The APM solution has also helped the Muskegon team better align its resources. This has led to improved utilization of assets, as well as creating cross-functional teams to address issues directly. By pooling our knowledge together and taking the learnings that we identify in the APM software, we’re able to identify what caused a specific issue, create a policy—in hopes of catching that issue before it happens again in the future. Besides the organization changes that the APM solution has helped drive, the Muskegon team has also seen a reduction in re-work on the LEAP production line. “The APM tool has helped us support the work of the Operations and Technical teams to reduce re-work from 8-10% consistently to less than 1% in just the last few months,” said Kuipers. GE Aviation is looking forward to utilizing more of the APM capabilities in the future, including integrating more of databases to enable even more data-driven decision making and agile development processes. For us, digital transformation is important because it’s a competitive advantage. If you don’t embrace it, the speed at which change is happening—you’ll be left in the dust. Watch our on-demand webinar with ARC Advisory Group to learn about the right steps, people, and processes that manufacturers can put into place to enable predictive equipment maintenance—improving plant productivity, increasing product quality, and unlocking hidden capacity. Standardize the collection, integration, modeling, and analysis of disparate data into a single, unified view.